probably the best anime this season. Will need a season 2! I really love what time anime brings to the table. I haven't disliked an episode so far. I really love history and to bring back characters from various time periods to help a cause (good or evil) that's awesome. I wish they would bring in characters like kublai khan and so one haha. Long after the battle should have been over, the soldiers noticed that the arrow-riddled, wound-covered Benkei was standing still. When the soldiers dared to cross the bridge and look more closely, the giant fell to the ground, having died standing upright. This is known as the "Standing Death of Benkei" (弁慶の立往生, Benkei no Tachi Ōjō). Episode 8 is now up after productions issues delayed its broadcast. 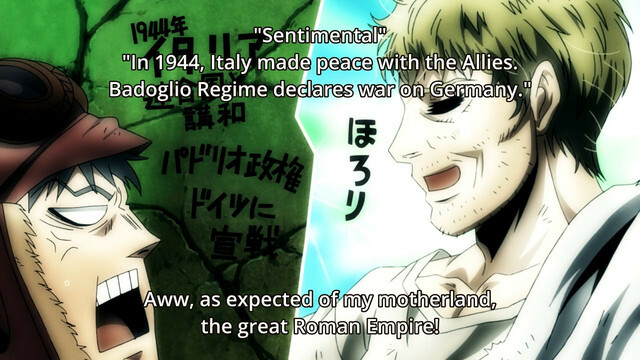 That part with Scipio speaking Latin and meeting a Japanese pilot thinking that it's part of the Roman Empire is pretty hilarious, something I never expected in a show like this. In the meantime, Haruakira, a.k.a. Seimei, is searching for Hannibal while Nobunaga is loading up on firepower having gotten their hands on a gatling gun and making plans to liberate a dwarf village, who is found by Toyohisa who he calls gramps. However, the elves are not on-board with the idea as elves and dwarves have been hostile towards each other, but Shara agrees. This was pretty much all setup, and a pretty lighthearted one given the atmosphere of this show, but nevertheless it maintains its focus. Leaving a "useless" gatling gun to Nobunaga, whose lit eyes looked like a lil kid in a candy store. ➜ ➜ ➜ ᴇʀʀᴀᴛɪᴄ sᴄʜᴇᴅᴜʟᴇ........... s ʟ ᴏ ᴡ ʀ ᴇ ᴘ ʟ ɪ ᴇ s.
Everyone teams up and grins like a maniac! If Nobunaga starts crafting bullets for the gatling gun, I'll feel bad for everyone else. From what I can remember, I don't think the Ends have anyone past the 19th century. The gatling gun, especially if mass manufactured, would turn the tide quickly. Besides that I really like the interactions between these figures. Toyohisa and Hannibal's meeting was tense, while Scipio and Kanno's was humorous. I'm a little surprised that the big Drifters group are splitting up again. I would have thought that at least one other would stay with the Japanese trio. From what I can remember, I don't think the Ends have anyone past the 19th century. Yep, those are the only two I'm aware of. Although it is funny how, despite most of the Drifters so far coming from a time after black powder became prominent, they have the two figures from the oldest period of antiquity, those being Hannibal and Scipio. Am I the only one that doesn't understand a single thing that's going on??? Deja vu, i've just been in this place before. The Drifters have to slaughter everybody else who has a weapon or superpower, because everybody else is out to get them. I think that's all you really need to know about this series. 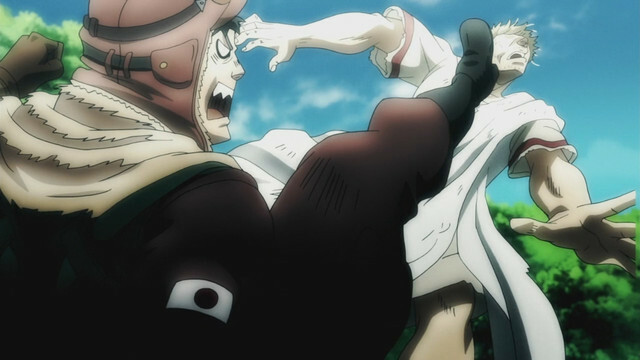 For being a pretty gore filled and brutal anime, this episode had a lot of moments that made me smile. 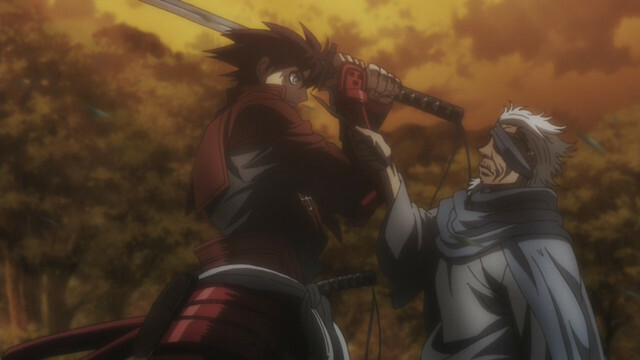 Even if Nobunaga has ulterior motives, it's awesome to see the unity the Drifters are attempting to create (both on purpose and by coincidence). Having the Elves and Dwarves on their side will be extremely beneficial as you have great marksmen and engineers. The fighter pilot has the dog/beastmen worshipping him which gives another race to help unify their cause under one banner for all peoples. Curious to see if we jump right into the battle to free the Dwarves or if another Ends encounter pops up first? 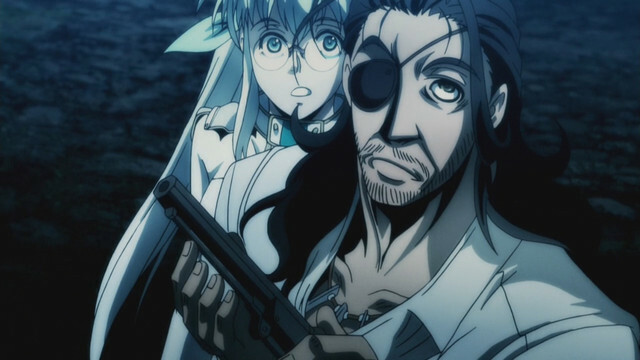 Drifters EP 8 "Mystery - Call Me"
Nobunaga having a gun fetish really is the most wonderful thing in the world. Isn't it, though? Just one of many things I enjoyed about this episode. From $6.95 U.S. to $7.99 U.S. per month. Use it to fix the forums, CR!